1. unmitigated effrontery or gall. Example: It took a lot of chutzpah to stand up to him the way she did. Audacity, nerve, or impudence shown by an individual dog, especially in the home. 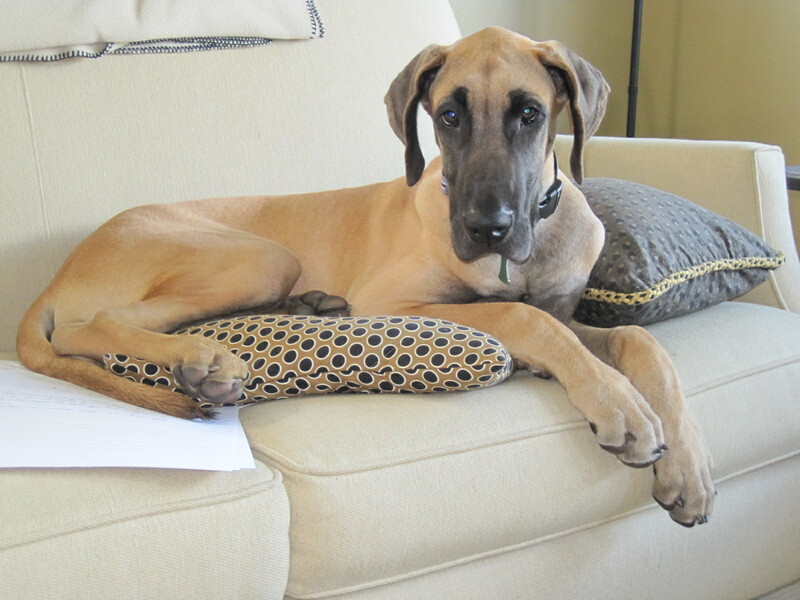 Example: By sauntering past its owner and jumping on the couch, the great dane puppy showed that it was not lacking in chutzpaw. Chutzpaw is for those walk-to-the-front-of-the-line moments when your dog does something so brazen that it simultaneously elicits both reproval and silent applause from you. Without cable TV in our home and access to shows that would have otherwise introduced her to the chutzpah of Donald Trump and other excessively confident hosts, I’m not sure where Luna’s picking up on this behavior. Apparently, B2 believes that it is inherent with girl puppies. That’s what MW told me yesterday. (I believe almost everything my spouse says). Whatever the origin–whether genetic, environmental, or cultural–Luna’s developed it. Burying her head in the recycling bag to fish out empty Trader Joe’s packaging. Again and again and again. You certainly don’t want to reward this audacious behavior, but you can’t deny its panache. I’d like to think that she doesn’t really know what she’s doing but deep down, I know she’s executing a plan. I wish I knew what it was.